HELPING THE GOOD DO BETTER pulls back the curtain on the corridors of power in Washington to reveal how social change really happens. This book offers lessons from the trenches on how some of this generation's most defining social issues -- AIDS, disabilities, global poverty, cancer, human trafficking, national service, early childhood education, and social entrepreneurship -- engendered landmark federal policies. Each chapter tells the story of how a particular issue was shaped by the movements and legislation at the center of public debate. Each case provides powerful lessons about how coalitions are built, strategies crafted, and powerful interests challenged in high-stakes, no-holds-barred political battles. Doing good requires more than just providing programs and services. It requires coordination, organization, and a new, stronger emphasis on and dedication to advocacy. Participating in advocacy is no longer a luxury-it is a necessity. Visionaries and activists together with "white hat" lobbyists -- people who understand the power of politics and who are able to put it to work to serve the public interest -- have won some of the most transformative policy fights in recent times. The culmination of those experiences, of fighting and winning on behalf of public interest causes, is presented here in a new theory for social change. Successful campaigns and movements must possess a lobbyist's combined approach to policy, politics, and press. Leveraging the 3 P's, with true passion and discipline, can create results that are nothing short of awe-inspiring. 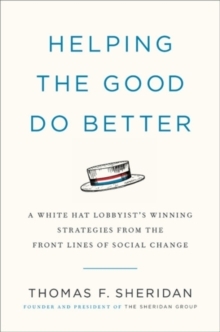 An insightful first-person guide to advocacy by a white-hat lobbyist who was in the rooms where historic social changes were made, HELPING THE GOOD DO BETTER is a direct and honest look at government in action and the behind-the-scenes players who help make progress a reality.